Basketpacking: It’s like Bikepacking, but for Nerds! The only bike I know how to build is an adventure bike. The humble basket is making a big comeback. Once a staple of kit on any bike used for more than just the occasional pleasure ride, the basket seems to have fallen out of favor, replaced by panniers and backpacks. But like all trends that reach a critical level of “uncool,” things have a way of cycling back around again. The hipsters are migrating right back to these little wired havens of cargo management in droves. The Grant Petersen crowd, riding Rivendell bikes and sporting enough domestic merchandise to single-handedly keep a local economy afloat, never really left the basket behind, and they do about as much camping as anyone. I think it’s about time I learned a thing or two. 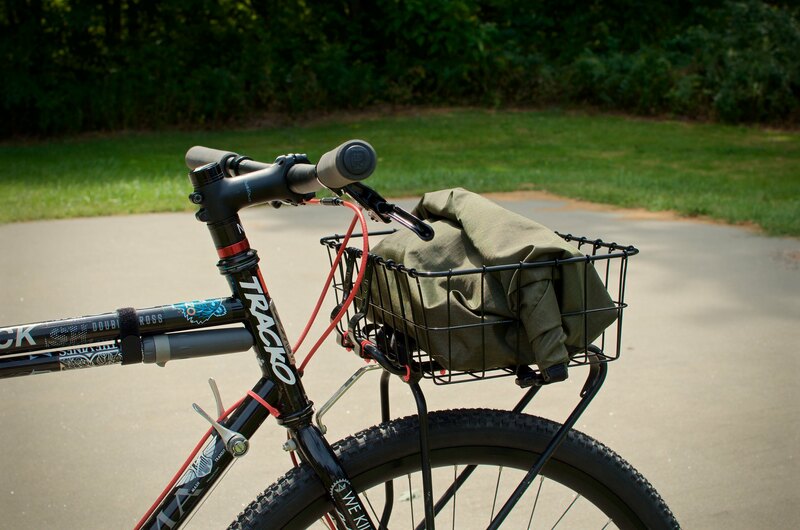 I’m using the classic Wald basket, zip-tied to an Ortlieb-manufactured Racktime rack. The bar bag is special…. scroll down for the full story. 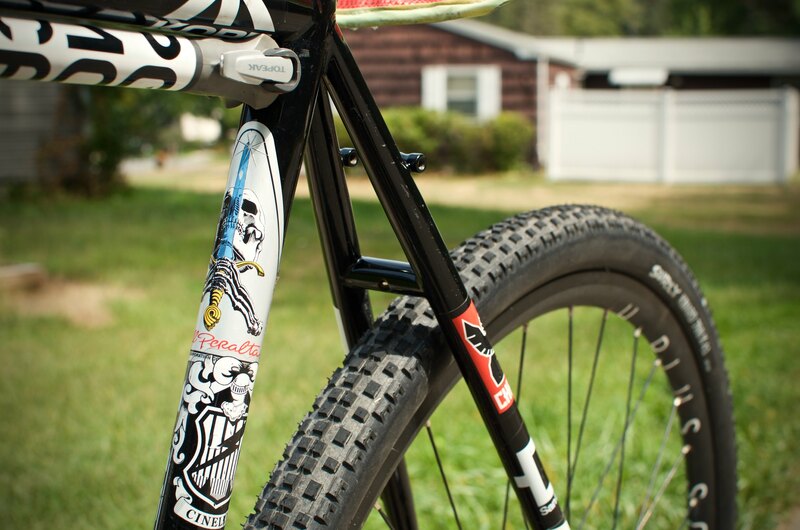 The flat bars was a conversion I have actually been thinking about for a while. I was very close to going with something swept-back like the Soma Sparrow or Clarence bar, but at the last minute, I went with a flat bar for more leverage. It was an economical switch- I reused all my old housing, the Shimano short-pull brake levers were $18, and my local shop had the flat bar laying around for $15. It’s indescribably fun to ride- I didn’t anticipate enjoying it as much as I am. I think I’ll leave these on for a while. Since I don’t have a bar-end shifter anymore, I threw on the other downtube shifter. I think I actually prefer downtube shifting to bar-ends, since I have a tendency to hit my shifter with my knee. Yes, even after some 15,000 miles of riding with that original shifter off my first bike, it too has been replaced. Goodbye, old friend! Tires are new, too. 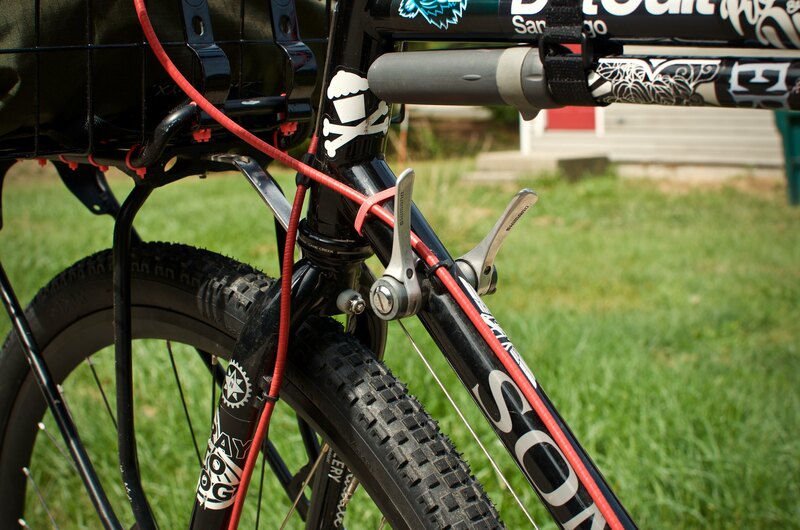 I’m going with the Surly Knard for this do-everything bike. 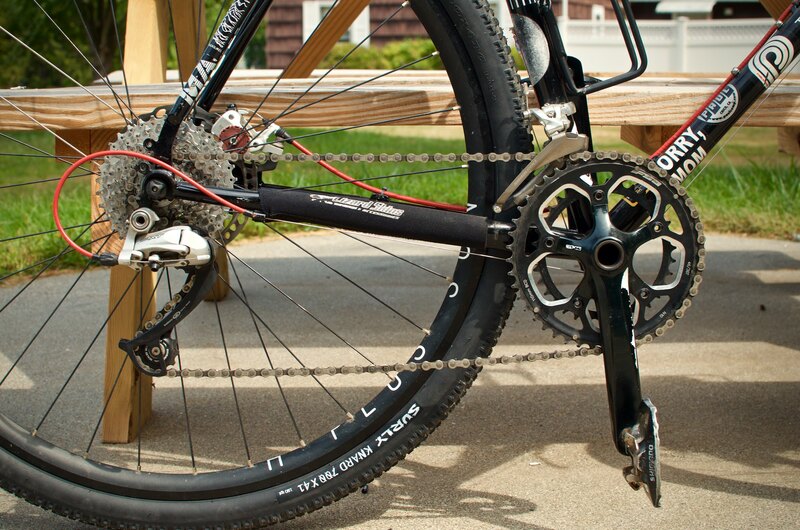 The double cross frame clears it with room to spare! 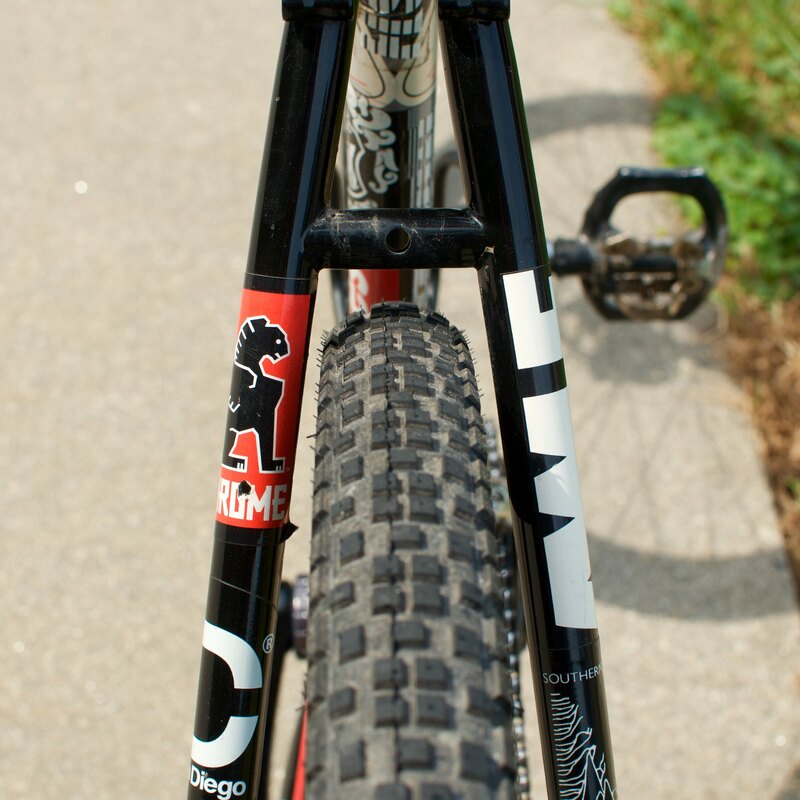 With tires like these, I’m not starved for anything fatter like the Soma Wolverine can run. These are wide enough for singletrack and super-comfortable street riding, and the bike still feels snappy and quick when I put down some watts. I’m using the 27 tpi version of the Knard for a little extra sidewall strength, since I’ll be commuting all winter on this bike. 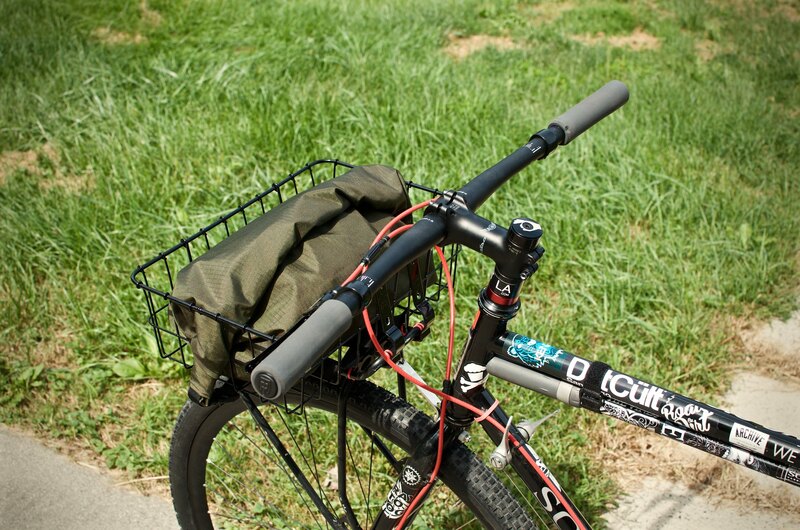 Ok, let’s get to it; the real innovation of this new rig is that bar bag! 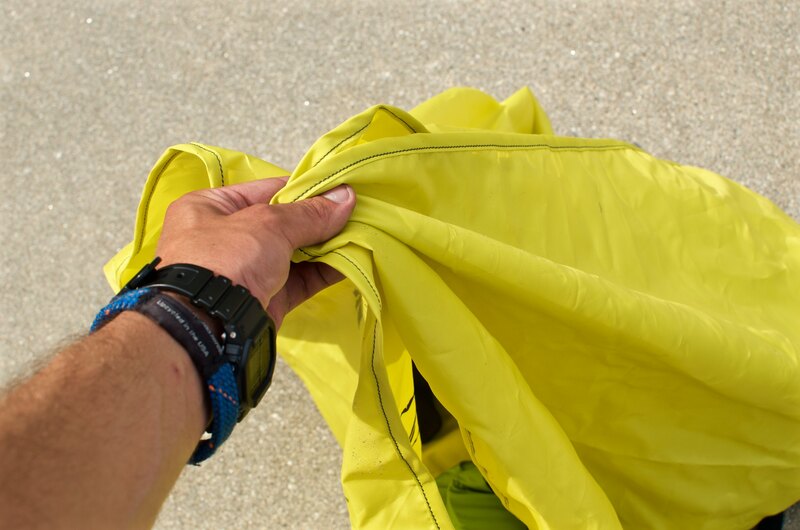 First things first, the Arcteryx Haku is the perfect size. 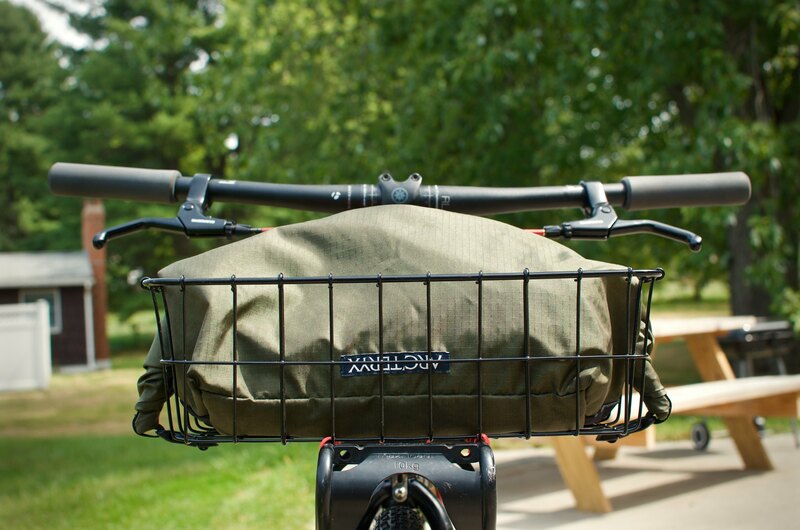 It’s weather-resistant and roll-top, and the dimensions fill the Wald basket neatly. It’s expandable, too, since it closes with a roll-top. If you need to stuff it, it’ll accommodate. There’s no structure to it at all, so if you need to flatten it out completely to put in a case of beer, it disappears. What makes this bag special is the rope-management system. Here, we’ll skip the rope and try some typical handlebar basket fare. Yes, that’s the same bag! 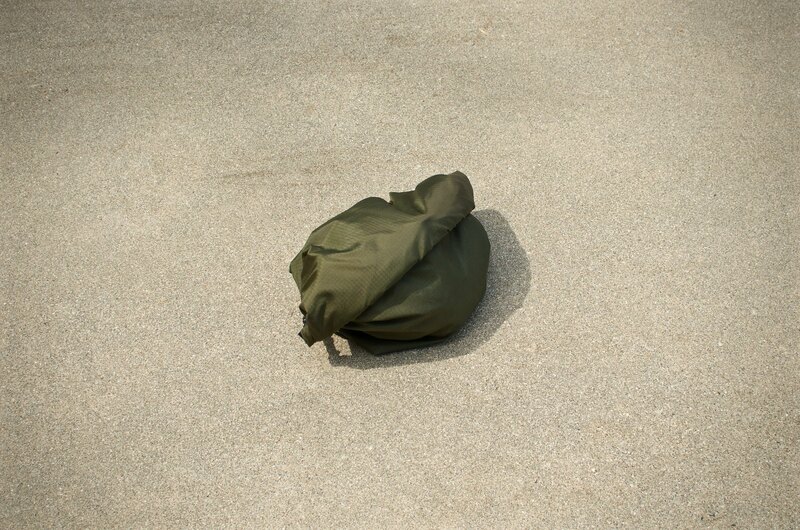 The Haku has an integrated tarp on the inside that lays out flat, with the dark-green shell underneath. You can lay it out at camp for a nice place to sit, cook, or nap. It’s also a cheery color, which makes it easy to keep from losing your spork. 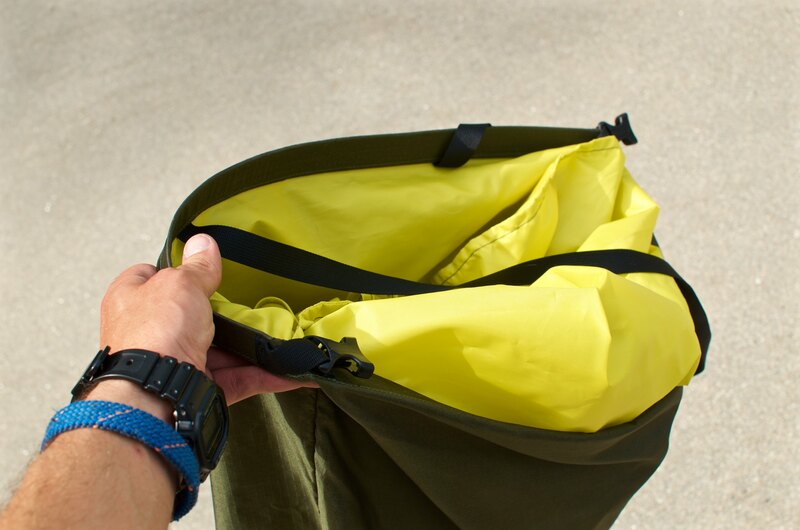 And all of your stuff tips right inside the bag, neat and tidy! It’s a beautiful, satisfying feature that works well. It’s impossible to lose anything and the formless nature of the bag’s green shell lets everything settle into the perfect Wald basket shape. 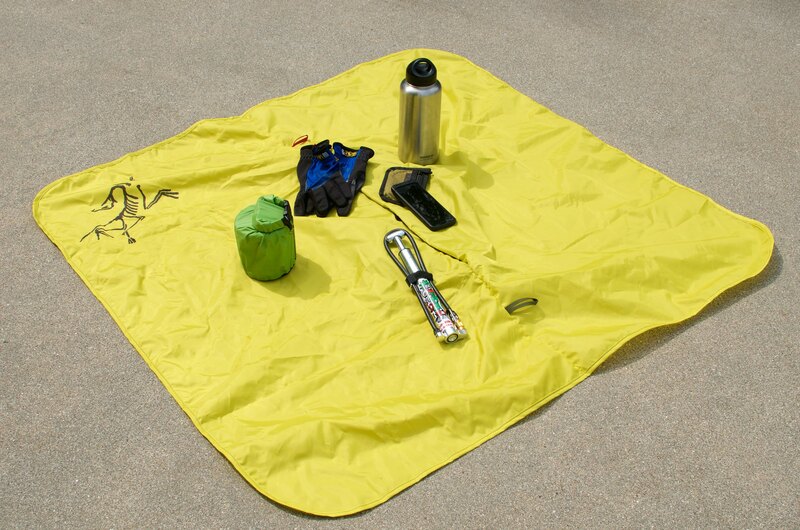 Once your stuff is inside, you can brush any dirt off the bottom of the tarp before you tuck it all into the green shell. Then, just roll it closed and you’re good to go! The Haku buckles nicely with the Wald, so you don’t need a cargo net, and those straps can also be tensioned to keep things from moving around. Does it get any better? It all rolls up neat and tidy, and looks good, too. I’ve always appreciated Arcteryx’s penchant for minimalism. I don’t want to call myself an innovator, but this thing is really cool. It’s gonna be fun breaking out the Haku on campus for a mid-lawn study session. It’s the perfect basket bag for me, and I’m looking forward to getting out for some camping with it! Alright, it’s official- I’m ready for the semester. My commuter rig is ready to rip! Posted on September 3, 2016 September 3, 2016 by mdiltheyPosted in Tips and TricksTagged Arcteryx Bag, Arcteryx Basket Bag, Arcteryx Bike Gear, Arcteryx Haku, basket bikepacking, basket camping, basket packing, basket touring, basketcamping, basketpacking, Flat Bar CX, Flat Bar Cyclocross, Haku Rope Bag, Soma Double Cross, Soma Double Cross Disc, Soma Double Cross Flat Bars, Soma Double Cross Front Rack, Soma Double Cross Touring, Soma Flat Bars. That bag looks reeeeeeeeeally cool. What do you think of the Racktime rack? It seems to sit really high compared to other basket/rack combos, was curious if it effected the handling. I’m torn between that one and a couple of others but since it’s the least expensive of the bunch it’s kind of leading. 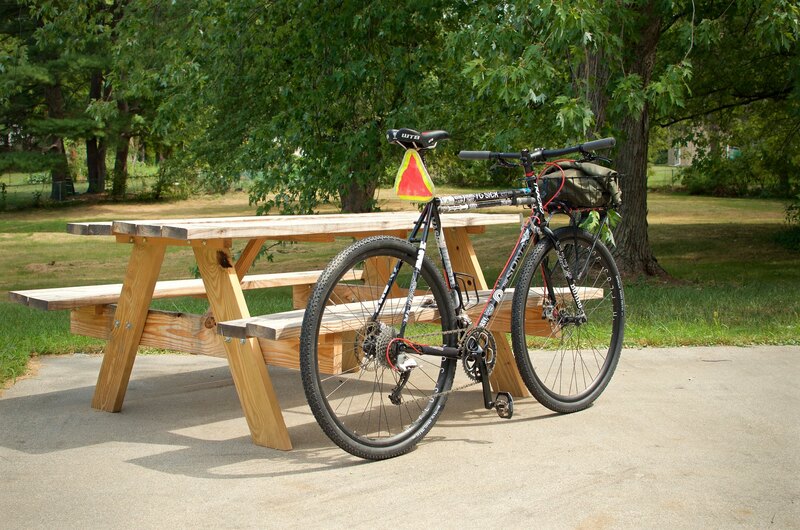 Love the whole setup though, I’m heading that way for my commuter since I can’t park my bike in my office anymore. You hit it. It sits really high compared to the others and it messes with the handling. I recommend spending a bit more and getting a better fit for a front rack. It is very, very sturdy, though. Just picked up one of these frames to gift to my wife and this is the most inspiring build I’ve found yet. I’m going to leave the design of the build up to her but I’m toally going to show her this one. Is it still the same today, or have you updated it or sold? 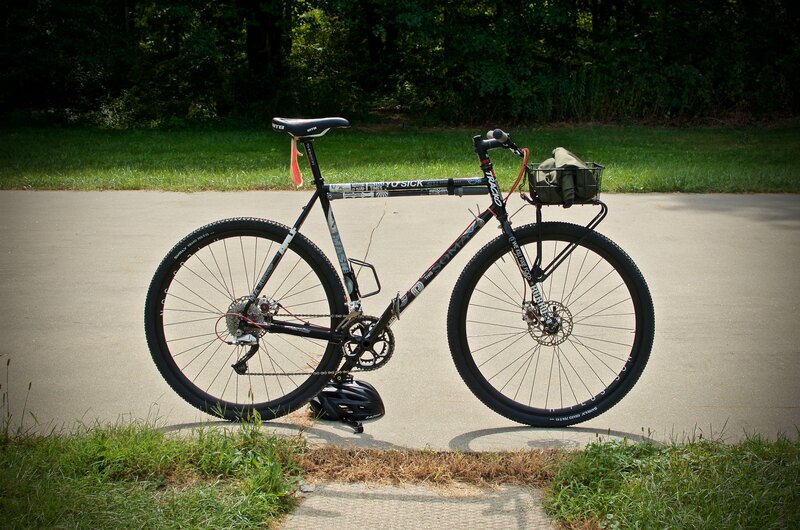 I dig the front rack setup but am wondering what the most ideal front rack would be for this frame since you mentioned having something lower would be better? I sold this bike as-is, but I did switch back to drop bars for stability. The best front rack I found was the Soma Lucas rack. it’s much lower, fits awesome, looks great. And it’s cheap! Sounds like a fun build! I’d love to see it when it’s finished! As if Bike Packing wasn’t nerdy enough!